Two dogs in love together have the makings for either a fantastic relationship, or an utter disaster. They may end up spending a good portion of their time trying not to offend one another. The Dog is a loyal, but skittish Chinese astrology sign that is easily excited. They tend not to participate in idle banter. Everything for them is a debate about deeply held beliefs and they are quite passionate about these beliefs. The dog-dog compatibility can be fantastic in such a way that they quite simply are incapable of being with anyone else. However, upon discovering that their partner has equally high standards, the two may well be able to let their hair down and get comfortable with each other. Mutual trust and comfort will be key to the success of the friendship between two dogs lasting more than a few days or weeks. While this will inevitably be a part of any relationship in which Dogs are lovers, it will likely only be a small part. The dog man and dog woman are far more likely to spend their time together discovering new ways in which to get each other in trouble. Adventure abounds when these two with such high energy and curiosity team up. Many Dogs, while seeing themselves as trustworthy, feel a constant, irrational fear that no one else can be trusted. They can also feel an incredible loyalty and trust toward one another. However, the male dog and female dog soulmates must either constantly forgive one another for base transgressions or agree on almost everything. The high strung and high energy Dogs may manage to keep from stepping on one another’s feelings and toes by constantly remaining in motion. Temper issues may be quite common in a Dog-Dog marriage, and more disturbing than the love compatibility they share. This is probably best dealt with through work. They often feel the need to stay active. Find some simple task that can either be done together or apart and work off the frustration else be ready for a breakup. Chinese zodiac compatibility predicts that the dog animal sign, in short, have clearly delineated ideas of what is right and what is wrong. This can lead directly into zealotry, dogmatic entrenchment, and willful narrow-mindedness. On the other hand, they are also prone to simply barking. They’ll get awfully worked up about just about anything, then calm right back down and make friends all over again. It might be worth keeping in mind that not every little thing is a life and death, existential challenge of a disaster. Calm down a bit and learn to relax. While the Dog may seem blunt, dogmatic, zealous, or narrow-minded at times, business is one arena in which these are not necessarily a bad thing if handled carefully together. The open frankness of the Dog may, in fact, be refreshing to those they deal with. One will always know where one stands with a Dog. In the Dog Dog relationship, both will work very hard to keep their word. A business run by two Dogs will be upfront about whether or not they think they can accomplish a given task, or even if they’re willing to try. A Dog is the last one that anyone expects to make a promise that it can’t keep. Generally speaking, if a Dog Dog in love has failed to follow through on a promise, it is because of factors well beyond their control. 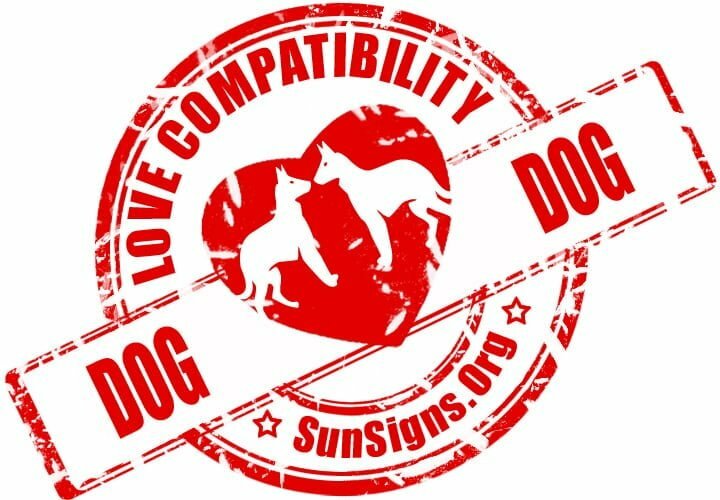 Dog & Dog Chinese Horoscope Compatibility Rated 4 Hearts!